Dirty water and mud washing into the streets – these are a few things on construction sites that pose such a nuisance and, at the same time, such a difficult challenge to control. However, ignoring it is simply not an option. Today’s contractors and engineers are faced with stringent EPA water quality discharge requirements, including NPDES Phase I and II regulations and increased enforcement on job sites. Curlex SiltTRAP was developed to help meet regulatory compliance standards by filtering out sediment from runoff water before it enters storm drains in construction areas. In addition to the compliance requirements, new residential and commercial developments can enhance the appearance of their projects, while solving problems of soil loss and water runoff by using Curlex SiltTRAP. Since these developments are designed to attract buyers or tenants while under construction, it’s vital to the owners to employ an aesthetically pleasing approach to their projects. 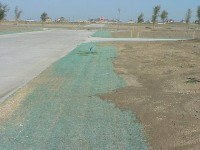 The green color gives the appearance of instant natural turf, masking its real purpose of providing erosion control for soil loss and water flow control. SiltTRAP offers a unique way of installing a temporary buffer strip to capture sediment before it washes away, filling gutters, clogging pipes, and generally creating a mess. The naturally seed free, unique Curlex® excelsior fibers in SiltTRAP filter soil from the runoff and greatly reduce off-site problems without the installation and disposal hassles of silt fence. All components of SiltTRAP are degradable, thus there is no need to remove the product after the construction phase is complete. Curlex SiltTRAP with its QuickGRASS® (green pigment) fibers provides a tremendous visible benefit that is seen the moment it is installed. This is well received in residential and commercial areas where you want to promote a finished effect when your visitors are entering or leaving the site. Curlex SiltTRAP fibers expand when wet creating a ”clinging” effect to the soil, making the blanket become twice as thick, thereby adding additional protection during heavy rain. The same fibers then slowly release the absorbed moisture back to the soil creating a hygroscopic action that nurtures seeds and promotes revegetation. Watch the Natural Mechanical Functions of Engineered Curlex Fibers. Learn more about the differences amongst various fibers used for erosion control. Curlex is considered the industry standard by many because of the plethora of Curlex Features and Benefits. Curlex SiltTRAP is an excelsior buffer strip matting for the purpose of sediment capture at the perimeter of active earthwork projects and along curbs and paved surfaces. Excelsior Buffer Strips shall be Curlex SiltTRAP, as manufactured by American E xcelsior Company. SiltTRAP shall be a specific cut of Great Lakes Aspen curled wood excelsio r with 80% six-inch fibers or greater fiber length. Fibers shall be curled with soft barbs to allow for an interlocking matrix. The top of each blanket shall be covered with photodegradable polypropylene netting. SiltTRAP shall be naturally seed-free, contain no chemical additives, and be of consistent thickness with fibers evenly distributed throughout the entire area of the product. Excelsior color shall be QuickGRASS green. SiltTRAP is available individually wrapped or in master packs to allow for mechanical unloading and stacking. Biodegradable E-Staples® or steel wire staples a minimum of 6” (15 cm) in length. Disclaimer: Curlex SiltTRAP is a system for erosion control and revegetation on perimeter areas of residential, commercial and industrial construction sites. American Excelsior Company (AEC) believes that the information contained herein to be reliable and accurate for use in erosion control and re-vegetation applications. However, since physical conditions vary from job site to job site and even within a given job site, AEC makes no performance guarantees and assumes no obligation or liability for the reliability or accuracy of information contained herein, for the results, safety or suitability of using Curlex SiltTRAP, or for damages occurring in connection with the installation of any erosion control product whether or not made by AEC or its affiliates, except as separately and specifically made in writing by AEC. These specifications are subject to change without notice.